Scott Bandura, who plays baseball for Springside Chestnut Hill hits a long ball to the outfield in the first inning of their against Germantown Academy on April 9, 2019. Logan Keller’s sacrifice fly scored Luke Kania, who doubled, in the visiting ninth as the Haverford School baseball team edged Malvern Prep, 2-1, on Tuesday. Zak Summy got the win in four hitless innings of relief with six strikeouts. Chris Clark started the game for the Fords and struck out seven over five innings. Clark and Summy stranded 14 baserunners. 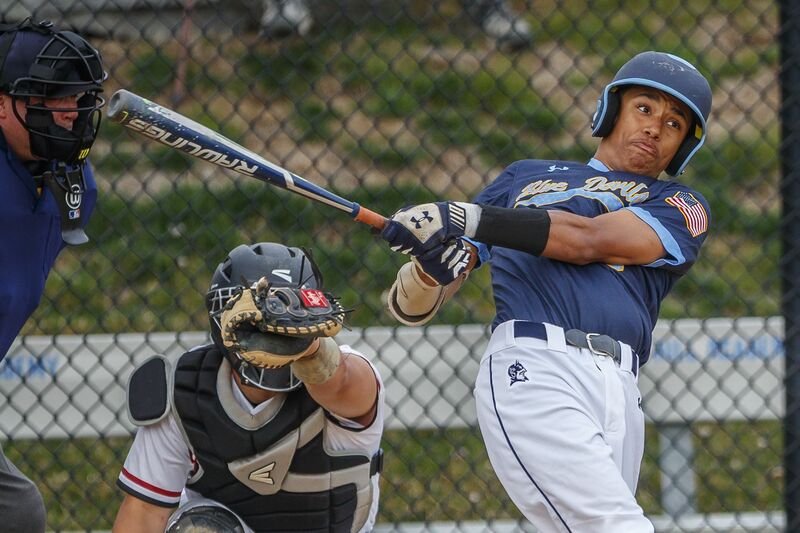 Brian Virbitsky went 3-for-4 with three doubles and three RBIs to lead Episcopal Academy past Penn Charter, 8-2. Jack O’Reilly allowed five hits in six innings and struck out six to earn the win for the Churchmen. Pat Elliott homered and knocked in three runs as Springside Chestnut Hill downed Germantown Academy, 10-0. Jahli Hendricks added two doubles for the Blue Devils. Neil Bennett knocked in two runs with his first varsity hit as Germantown Friends defeated Academy of New Church, 14-4. Andrew Sicinski launched a grand slam and Justin Barcowski doubled in Father Judge’s 10-0 win over Devon Prep. Moses Clemens went 2-for-3 with a home run and three RBIs to lift Souderton over Central Bucks East, 9-7. Blake Mayberry delivered with a double and an RBI as Central beat Northeast, 7-5. David White helped his own cause with two RBIs for the Lancers. Mark Moore helped himself to a double and got the win on the mound as Prep Charter topped Mariana Bracetti, 4-2. Joe Alper drove in a pair of runs for the Huskies. E.J. Bahamonde punched out 11 batters in five innings as Franklin Learning Center knocked off Ben Franklin, 4-2. Hector Pena had two RBIs for the Bobcats. Joe Englart smacked two doubles in Phila. Academy Charter’s 15-0 victory over Bodine. Juliana Nocito went 3-for-4 and hit the go-ahead RBI double in the visiting seventh as Nazareth Academy edged Mount St. Joseph, 6-5. Anastasia Lewis scattered four hits and struck out 12 in Penn Charter’s 4-3 triumph over Springside Chestnut Hill. Abbey Quinn doubled and homered for the Quakers. Lauren Hagy homered in support of Dana Bell’s 12-strikeout performance in Archbishop Ryan’s 3-2 victory over Lansdale Catholic. Jen Llewellyn homered for the Crusaders. Cori Jones went 3-for-3 with a double and a home run to lead Neumann-Goretti past Conwell-Egan, 10-0. Abby Burns doubled four times and drove in three runs as Souderton upended Central Bucks East, 15-5. Katie Huber added a double and five RBIs for the Indians. Ashley Maldonado tripled and had three RBIs as Esperanza cruised past Bodine, 21-0. Rose Luciano hit the game-winning double in the home seventh as Washington defeated Olney, 17-16. Kiara Reynoso and Keidy Valdez each had four hits and Aleiyah Aguero went 3-for-3 with four RBIs for the Eagles. Xiania Price mashed two home runs and had six RBIs, and got the win on the mound, as Southern beat Martin Luther King, 14-2. Logan Stewart tripled and drove in five runs in Interboro’s 12-2 decision over Chichester. Annie Whalen recorded a game-high four goals in Archbishop Wood’s 10-5 win over St. Hubert. Lindsay Faul chipped in two goals for the Vikings. Alex Almonte led a balanced Archbishop Wood attack with two goals in a 19-2 victory over Lansdale Catholic. Cate Cox scored four goals as Radnor rolled past Strath Haven, 20-7. Kate Hartnett added three goals for the Raiders. Olivia Brenner, Kaitlyn Henning, Olivia Kingsborough, Madi McKee, Meghan McLaughlin, Kara Nealon, and Sydney Pyon each scored two goals as Garnet Valley beat Marple Newtown, 22-3. Hannah Gillespie notched four goals to lift Notre Dame over Penn Charter, 13-6. Manas Narula defeated Huihuang Zhu in straight sets, 7-5, 6-0, to help Masterman defeat Central, 5-0. Masterman improves to 5-0 in the Public League.